As Above is a unique physical experience game. 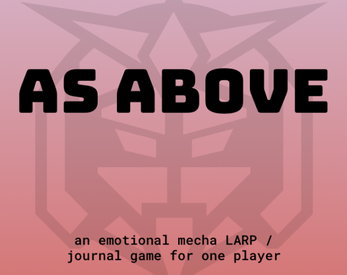 You will be enacting physical actions in the world to evoke emotions, like you would in a LARP, but at the same time will be chronicling the actions of a host of characters as they move through the world in a war between the Steel Legion and the Jhin. Most of your physical actions will involve manipulating a physical mecha, representing your character's mecha in the story you write. You will cary this mecha through the world with you, forming a bond as it deals with cuts, burns, or worse. Playing the game can take between 3 weeks and 3 months time.